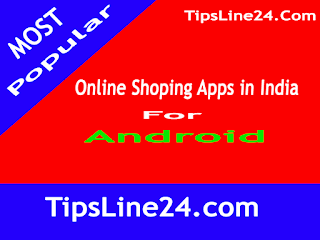 Most Popular Online Shoping Apps in India for Android Mobile. Currently, online shopping apps have become most popular. At this Time many people are shopping from online. There are many facilities to shopping from online. You can choose your Expected products online from at home, you don't need to go to market for this. After you choose your Expected product you can order in online. After order, The product will reach to you. Then you can understand, how much improved the technology. However, India is much ahead for online shopping. There are many sites or organizations in India who sell products online. Online Shopping companies are now making more progress. They give their own app to their customers so that their customers can purchase online products more easily. Today I will share with you three online shopping apps. Actually, It is not possible for me to share the onlie shopping apps of all countries. Today I will share the online shopping apps of India. There have many online shopping apps in India. But now I will share with you three online shopping apps. These apps can be used on your Android mobile. If you are not in India or have not used Android Mobile, you can not download this. The details below are given.